In just a few weeks, a who’s who of edtech professionals and industry thought leaders will gather at the MIT Media Lab on August 1-3 for the first-ever Connected Learning Summit (CLS). The Summit’s tagline of “Create. Play. Mobilize.” elicits a call to action that commands and underscores the importance of educational media. FableVision and our partners at TERC are proud sponsors of this inaugural CLS, and I’m looking forward to moderating the Zoombinis panel on August 1. During this event, key personnel will share the story of how they reimagined the beloved educational game, and they’ll also share an update on their game-based research. The original Zoombinis was released in 1996 and quickly became the golden standard among fans of educational games. Then in 2015, FableVision, Learning Games Network, TERC, and EdGE at TERC worked closely with creator Scot Osterweil to reimagine and remaster the original game for modern devices and audiences. Two additional key members of that development team were Dr. Jodi Asbell-Clarke and David Libby. As the director and co-founder of Educational Gaming Environment (EdGE) at TERC, Jodi has spent 20 years designing and researching curriculum and professional development. David is TERC’s Chief Technology Officer and served as overall project manager for the revamped Zoombinis. We sat down with Jodi and David for a special sneak peek of what we’ll be discussing at the Connected Learning Summit. Read on for a short preview of our CLS panel. We can’t wait to answer your questions and reintroduce you to our favorite blue friends as they help us bridge formal and informal learning – and change the world of education for the better. Wednesday, August 1 at 2:30 p.m.
Will you be there? Tweet us at @FVStudioBoston with #CLS2018. David, Jodi, tell us more about your respective roles. What is the focus of EdGE’s research, and how does it fit into TERC’s overall mission? Jodi: EdGE is the Educational Gaming Environments group at TERC. As part of TERC’s mission to reach a broad and diverse audience of learners with innovative STEM learning opportunities, EdGE examines how digital games can be used as assessments to measure learning that might not be revealed by ordinary tests and schoolwork. STEM education is all the rage now, but TERC has been focusing on math and science learning since the early 1970s! What makes the math/science education space so exciting to be working in these days? Jodi: Some things have changed dramatically in the past few decades, and some things feel like they haven’t changed at all. What is exciting about right now is that people are realizing, on a large scale, that learning is not just what happens in the classroom and it isn’t all about direct instruction. Project-based learning, game-based learning, and other forms of interest-driven learning experiences no longer seem so marginalized, or fringe. I believe that providing these experiences is the only way to ensure inclusivity for learners who have cognitive differences, such as executive function disorders. I have seen so much talent within kids who have cognitive differences; we have to find good ways to tap into their strengths as opposed to remediating their weaknesses. Computational Thinking (CT) is such a rich arena for this pursuit. Many diverse learners seem well-inclined to CT practices, so we are trying to leverage that in our Zoombinis research. FableVision had a blast partnering with TERC (along with the Learning Games Network) to remaster Zoombinis in 2015. Why did TERC decide to revisit this classic game from 1996? David: TERC’s focus is on improving STEM education for all. We’ve produced a variety of content over the years, but Zoombinis was always special to us and remains one of our most successful projects in terms of the number of kids (and adults) reached. We heard from multiple original Zoombinis fans from the ‘90s that Zoombinis is what led them to pursue careers in computer science and other STEM fields! The love for the game was incredible. However, the original version was not being updated for current operating systems and popular devices like the iPad and Android tablets; some teachers were even keeping old Macs and PCs in the back of their classrooms just to play Zoombinis. 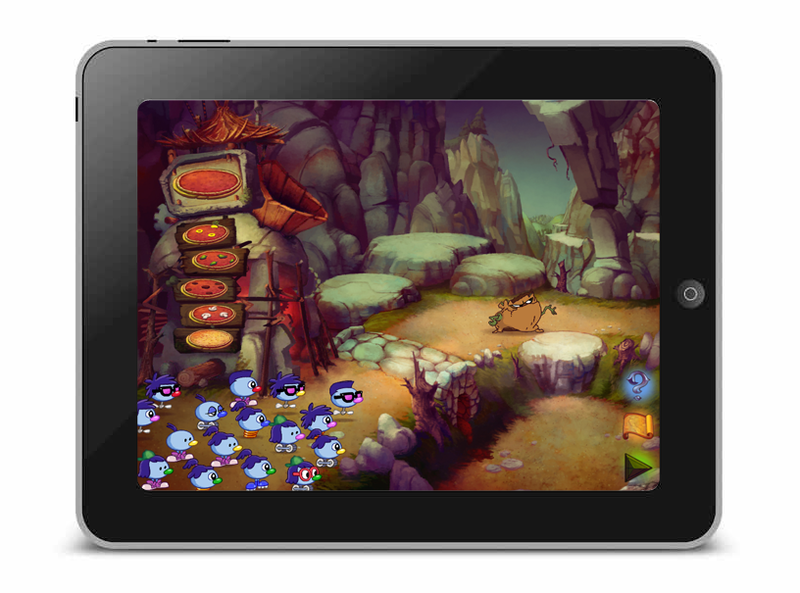 After some discussion, Houghton Mifflin Harcourt was kind enough to return the rights to us, and with funding from our Board and with the help of a Kickstarter, we and our partners were thrilled to relaunch Zoombinis for a new generation! David, you were the project lead for the Zoombinis remaster. What was it like overseeing such a large, multifaceted production with multiple partners? It was challenging, fun, and a great learning experience. FableVision, Learning Games Network, The Game Agency, and Tinsley PR were such a pleasure to work with, and everyone had such appreciation and love for the game that really shows in the final product. I have to include the fans as one of our partners too, especially our fan advisory board; their input and support was invaluable in shaping the new version, and they really helped us stay true to the original model while also adapting to today’s gaming environment. The vision for the game, the gameplay, the art, music (from the original), and build quality were key, but so was the marketing and press to make people aware that Zoombinis was back! The plush characters and pins we made as part of the Kickstarter rewards were a huge staff favorite…nothing like having several hundred plush Zoombinis sitting in your office. Scot's original Zoombinis character sketch. What was it like working with Scot Osterweil, creator of Zoombinis, on the reboot? Jodi, you recently finished overseeing a three-year research study of how Zoombinis can improve students’ computational thinking skills. What are some of your major takeaways from this study? We are currently conducting human labeling of extensive samples of gameplay observations to identify common patterns of gameplay that are consistent with CT. This lays the groundwork for defining the features we need to build automated detectors of CT learning within gameplay logs. We already have great inter-rater reliability on the human-labeling for two Zoombinis puzzles (“Pizza Pass” and “Mudball Wall”) and we are working on two more (“Allergic Cliffs” and “Bubble Wonder”). We are also continuing to build the automated detectors that will measure CT automatically in Zoombinis, and are excited by the prospect that we might measure CT in learners who may not exhibit strong skills in other forms of assessments. Many Zoombinis teachers reported that students who typically struggle academically were becoming leaders in Zoombinis activities, and whom others went to for support. This game has the potential to change the dynamic of the classroom and the relationships among the learners in extraordinary ways; we hope to provide this information to teachers in real-time, while their students are playing the game. By revealing when a student is excelling or struggling, a Zoombinis puzzle will help educators connect that individual student’s learning to CT in other aspects of life and school. We’re excited to join you at the Connected Learning Summit featuring our Zoombinis team to talk about the development process and hear about the research component of the project. What we can expect from this session? Jodi: We are excited to tell the logical journey of how Zoombinis not only made a comeback from hibernation as an edutainment game, but how it is actively changing how we think about learning today. The re-release of Zoombinis hit just when CT was taking education by storm, and we are fortunate to have the opportunity to study how it all happens.